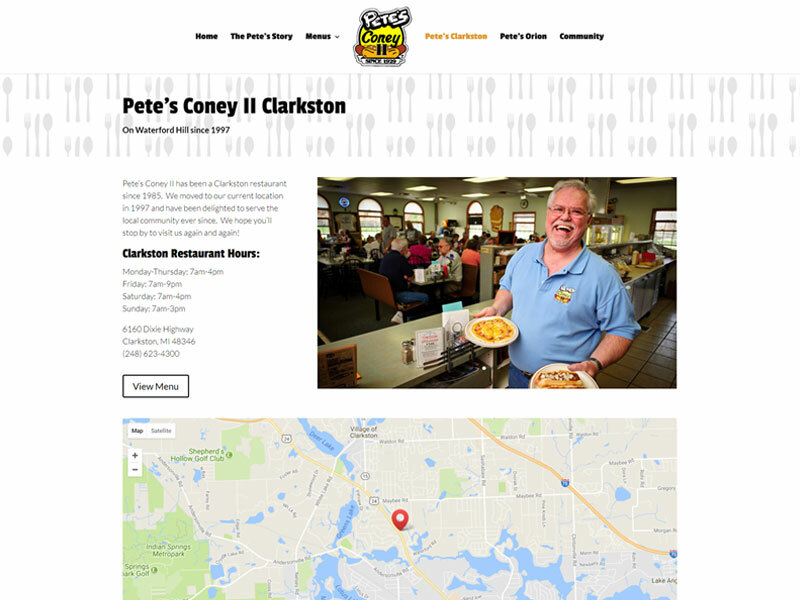 Pete’s Coney II is a family restaurant in Clarkston, MI. First opened in 1929, it is now on its fourth generation of ownership and (relatively) recently opened a second location. Our task was to create a visually engaging website to help Pete’s move fully into the modern era. While a chili chili recipe can be decades old, websites need to be kept up to date. So we set about building a digital home for this restaurant that is a second home to so many loyal patrons. One challenge is that each location has a different personality and a handful of different menu items. To help keep this clear, we gave each location a completely separate page rather than try to handle it on one page. Also important to the owners was a page showcasing their involvement in the community. 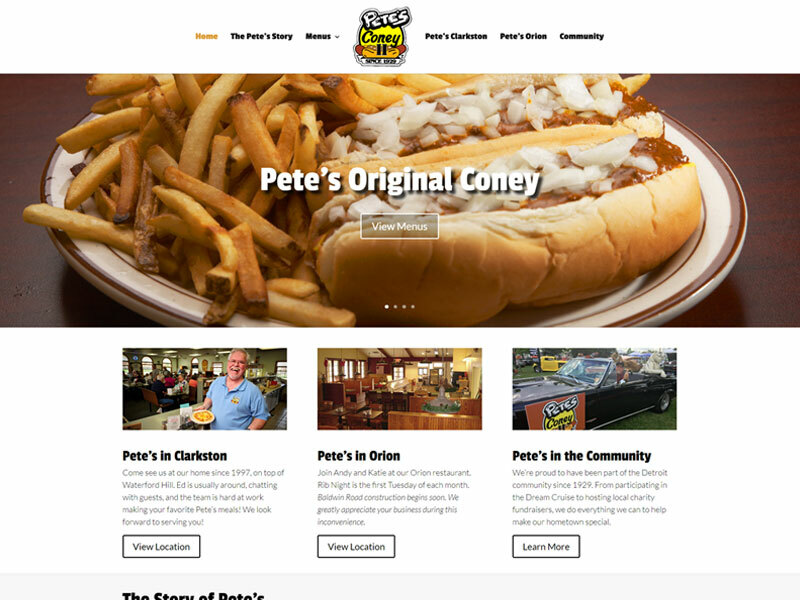 Pete’s hosts many fundraiser dinners and is an active part of the Detroit classic car scene. We helped bring this to life with a fun Community page that most restaurants don’t think to include in their sites. Our homepage featured big bold images of their delicious food. What better way to sell food than put professional photography front and center? This was accompanied by clear navigation to the internal pages of the site to quickly funnel users toward the location near them. Each location has it’s own page with the address, hours, phone number, and menu to help prevent any confusion. This was a critical element of the design since each location operates independently of the other. There’s nothing more frustrating than having a customer accidentally look up the hours for the wrong location and show up at your door after closing time. As an almost 90 year old business, Pete’s has a fascinating history. So many people ask who Pete is, the owners decided to write down the whole story and use it as a central part of their marketing. 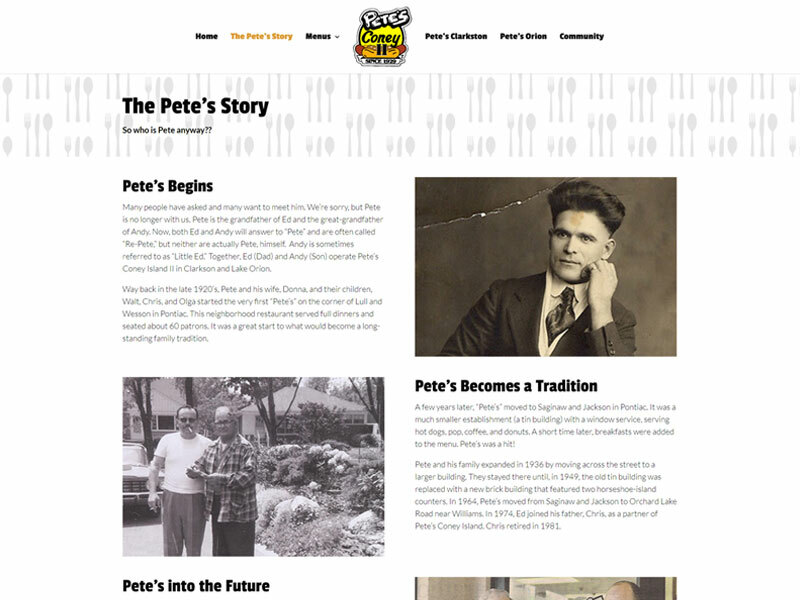 The Pete’s Story page chronicals all of the generations of management and all of the locations the restaurant has called home.